You are at:Home»Features»How do you price your barber services? How should you price your barber services? How do you price your barber services? Restructuring prices can happen for lots of reasons…for example shop refurbishments, new services, relocation and just plain increases mean that you lose some customers but not everyone is YOUR customer forever. Creating a picture of the price you should charge for the value you can bring will help you assess your worth. Check out the infographic above to help prompt your thinking. Brand positioning – that cheap Stone Island Puffa shipping from China on Ebay may be the bargain of the century but it could also be poor quality rubbish. Price says something about the authenticity and quality of the purchase. Competitive environment – surveying the competition is healthy. You may choose to price mid-range, bottom range or even lead the market but don’t make your competitors pricing a straight-jacket. 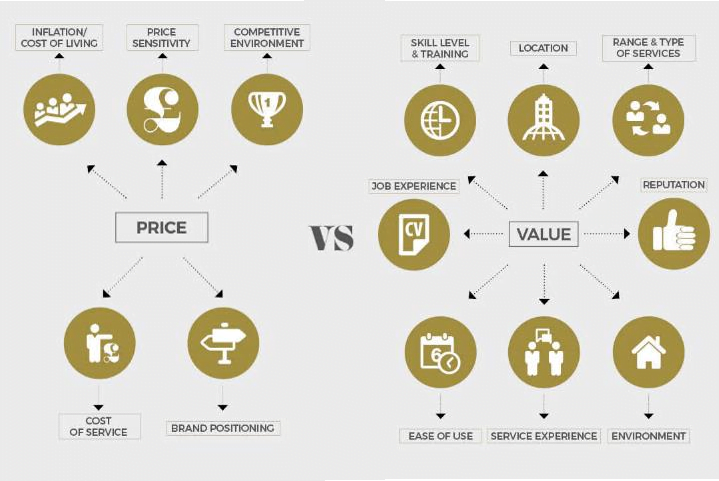 Price sensitivity – it’s likely that you are more price sensitive than your customer base. Think about where your target shops, what they wear and where they spend their leisure money. It may help you make a judgement. Cost of service – fixed and variable costs are a huge part of the equation. Keep a close eye on them or before you know it you are becoming a charity! Inflation/cost of living – stuff and services go up, so why not your stuff and services? Location, location, location – in your converted garage or on the High Street. There is value in both depending on your target market. Service experience – the artisan coffee, the great vibes, the speedy WIFI, the welcome smile. It all makes a difference. Skills and training – updated skills, broad creative horizons, competition wins and regular education should be shared with customers so that they can value them. Job experience – long experience doesn’t always equal a high price but shared experience and professional advice can help raise it. Environment – the beautiful premium barber chairs and stunning (spotless) interior, the amazing branding and comfortable waiting area – can add value. Range of services on offer – from line-ups to manicures and everything in between. There’s a customer for it all. Ease of access – great parking, appointments, walk-ins, queue management, opening times, online booking, contactless payment – anything for an easy life adds value. Reputation – those 5* reviews, amazing word-of-mouth, handsome Instagram gallery of work all take the risk out of a cut for customers and they are willing to pay for it. So, now and then, take a view on your price vs value to see if you have the best balance for you. This feature was previously published in the January to March 2018 issue of Modern Barber Magazine. Subscriptions are available for guaranteed delivery of every issue.